The Grumpy Ecologist: When is a dry wetland good? waterfowl, as well as passage waders, and hopefully the odd scarcity or two. attract good birds - but not every year. And then a look at progress on Ouse Fen. At around 500 hectares when completed, the Hanson-RSPB wetland project at Ouse Fen is set to become the UK's largest reedbed after gravel is extracted. However much of this needs to be imagined at the moment as only the early phases are in place. 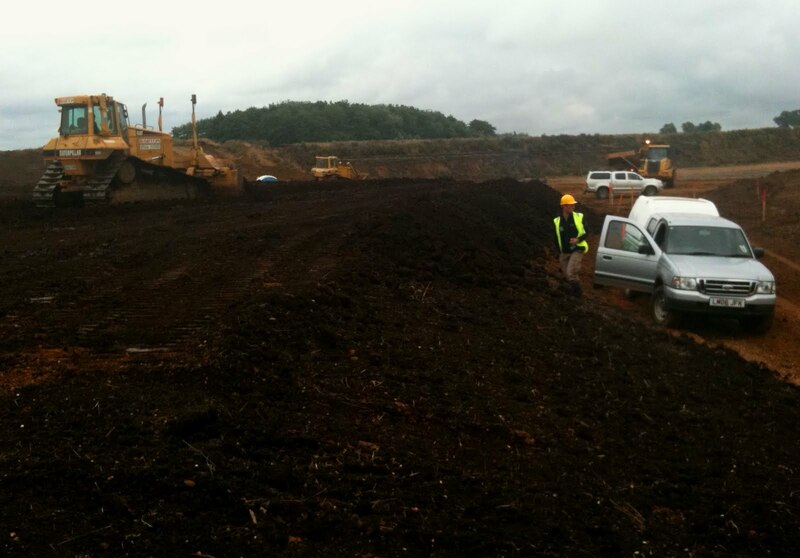 The photograph above shows the latest phase being landformed. The vehicle on the right is at the bottom of a channel through the future reedbed, the bulldozer is levelling out the base of the reedbed that will eventually be 70 cm under water. Birds were thin on the ground today; 14 Little Egrets, a Garganey, a Ruff, 2 Hobby, 4 Turtle Doves and a handful of Teal were the highlights. I realise it's a bit violent and against the orthodoxy but I've often wondered if ploughing parts of these scrapes (from a light harrowing to get a few annual weeds going through to a deep ploughing + harrowing to get some nutrients back into circulation) wouldn't be more effective than the supposed remineralization that takes place when the marshes are left to dry out in summer. The Grumpy Ecologist is old enough to remember the productivity of the back-filled pit sites in the Lee Valley (seed wise) and I can assure you that Italian scrapes (both grazed and ungrazed) that dry out pretty well completely on an near-annual remain close-to-crap compared with the initial boom year or two. Completely agree with you Touty, more disturbance would be good. However, many sites become scared of the views of visitors (including birders). Despite your comments on Italian scrapes, I think many European countries manage these temporary wetlands better than we do.